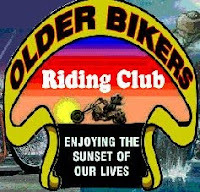 Older Bikers Riding Club is a national club currently forming as many as 14 chapters in 5 states, Texas, Georgia, Kentucky, Ohio, Indiana, and is looking to open more. 1: You must ride a bike or trike. When we say ride, we are looking for people that are out riding every week during the summer, traveling to rallies, bike nights, poker runs and using any other excuse they can find to ride. 2: No drinking while riding. We do NOT stop at bars when we are out riding. You can drink as much as you want when you arrive at a rally or get home, but we do not allow drinking while riding with us. 3: NEVER abandon another biker. If we see another biker on the side of the road, we always stop to help and never leave another biker sitting alone.